I’m posting this not because is a VoIP news but because I live in Florida and the hurricane season just started. For the next six months every Floridian will turn on the TV or browse the NHC website just for finding out when the next hurricane will strike. Each day, while commuting, I’m listening a news radio station and they give advices and present stories about hurricane. They give advices to install window shutters, to make water and food supplies and buy generators to comfortably pass those days after the hurricane (in case your city is hit). In contradiction with this, a friend of mine who renting a condo in a luxurious community told that he received precise instructions from his landlord about what to do in case of a hurricane hit. He is not allowed to install any generator or grill on the balcony or near the building and what is most important is not allowed to install window shutters. The only recommendation is to buy rental insurance. While to not use a generator or grill may seem reasonable to not have the right to install shutters seems kind of odd. If for a business a disaster is only a matter of money, for a person, represents something more important, especially if the disaster affect something called home. Exactly like my friend’s community, many expensive rental communities down here in South Florida, usually have gated entries with security all day long. And they say this is for the protection of their tenants. While most of them have this almost none doesn’t offer window shutters that to me look also like tenant protection. Shouldn’t be the law more restrictive with the landlords? It is possible for the law, here in Florida, to impose landlords the simple thing to install window shutters to all residents in the moment a hurricane warning is issued? If you own the home then it’s up to you what you do during a hurricane but if you are a rental you don’t have too much choice. We live in a country while the law protects its citizens, and in case you didn’t know there are laws which protect also the renters from landlord’s abuses but there is no law to protect them in this situation. While all media advice you to buy a carbon-monoxide detector if you buy a gasoline powered generator almost no generators manufacturer doesn’t include such a detector with the product. After each hurricane season the media presents cases where persons died because of invisible but deadly emanations of CO. Shouldn’t the law the one to impose manufacturers to include such basic detection device? If seems to much consider also the fact the law is the one that enforce producers to label each food product and list all the ingredients for the safety of the consumers. Then again why the law doesn’t see including such a device a safety method? If you have more examples or just want to express your opining please leave a comment. Hi. 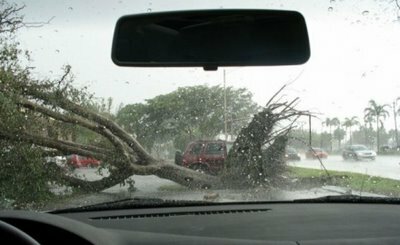 We are South Florida residents that have a blog focused on hurricane protection. We wrote a post recently about the rights of condo owners that you might be interested in. If you live in a condo or other property controlled by an association in Florida you may not know that you’re within your legal rights to put up Hurricane shutters even if your association says you can’t. You can read our post here - http://www.abigwind.com/2006/06/08/know-your-rights-hurricane-shutters-on-your-condo-or-other-property/ if you like.